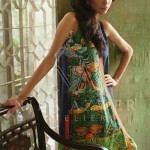 Nida Azwer is one of the most leading and one of the top celebrated fashion designers of Pakistan. This fashion designer is mostly women wear fashion designer.Nida Azwer offers with the casual wear, semi formal wear, formal collections plus occassional collections too. Freshly it launched new fashion Party Wear Dresses Collection 2014 for women.In this collection shows new fashion printed dress collection and also have different colour and prints to each other. Nida Azwar ready to wear dresses will bring rich fashion aroma in your festive closet with looks detailing. So do not miss the chance to garb praiseworthy and graceful dress 2014 from the house of Nida Azwar. Her Collection is beautiful an shows us formal wear kurti Dresses collection 2014 on the event of Eid-ul-azha.All the kurti is also printed and look exclusive,Here also shares some pictures of these collection 2014. Lets have a look on this breathable Nida Azwer Collection 2014.